The sixth installment in a franchise. A place few blockbuster series reach with some semblance of respect still attached to the brand, let alone any good will. But Mission: Impossible isn’t like most franchises, as each subsequent release is better than the last (with the exception of Mission: Impossible II). And this mission may just be the best one yet. Ethan Hunt (Tom Cruise) and the IMF team join forces with CIA assassin August Walker (Henry Cavill) to prevent a disaster of epic proportions. Arms dealer John Lark and a group of terrorists known as the Apostles plan to use three plutonium cores for a simultaneous nuclear attack on the Vatican, Jerusalem and Mecca, Saudi Arabia. When the weapons go missing, Ethan and his crew find themselves in a desperate race against time to prevent them from falling into the wrong hands. As far as Summer blockbusters go, Mission: impossible - Fallout is a little more complex in its storytelling. Now it won’t confuse audiences by any means, but a lapse in attention could cause one to lose a vital piece of dialogue along this ride. The film is about as close to a direct sequel as this franchise gets, as writer and director Christopher McQuarrie decides to pick up almost right where he left off, and doesn’t skip a beat in doing so. Not a moment is wasted, with every second of film being optimized to move the story forward to an ending that’s both thrilling and surprisingly emotional. For a franchise that spans over two decades now, Mission: Impossible shows absolutely no signs of aging. The same could be said for the leading man of this high-octane action series. At 56, Tom Cruise could just as easily be taking the easy roles, ones that require little physical strain and show off his acting chops. However, this is Tom Cruise we’re talking about, he’s likely to do the exact opposite. In this case, it means jumping out of a plane at 25,000 feet, leaping across rooftops, or anything else that involves Cruise putting his body at risk for the sake of the action. But no mission is quite complete without a team, and it seems the franchise is set on who the right pieces. The back and forth between Ving Rhames and Simon Pegg, as Luther Stickell and Benji Dunn respectively, is tremendously funny, and truly makes their friendship feel real. Rebecca Ferguson is thankfully back as Ilsa Faust, the ever-intriguing British operative who could be ally or enemy at any given moment, and delivers another great performance. There really isn’t a weak link among the cast, elevating the action and story into something greater. And it must be said, with no exaggeration, that Mission: Impossible - Fallout is one of the best action films of not only this century, but maybe of all time. Intense set pieces are littered throughout this film, but they’re crafted in such a meticulous way that you can't help your desire to see more. Whether it’s a brawl in a bathroom or a lengthy helicopter chase, Fallout will bring you to the edge of your seat and grip those armrests until your knuckles turn white. Mission: Impossible – Fallout is everything you could want out of this franchise. 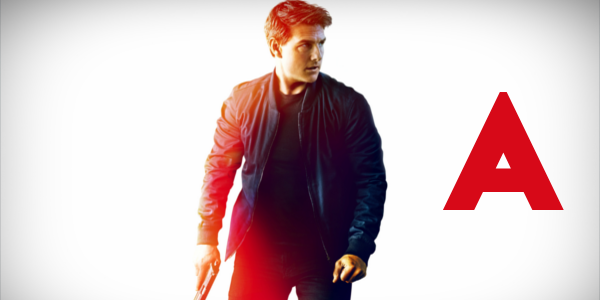 An engaging story, likeable characters, unbelievable action, and Tom Cruise doing crazy, dangerous stunts, all mixing together into a perfect concoction that makes every other action film look like child’s play. Outside of minor complaints about story elements being borrowed or retreads of some other spy films that have come before, there is nothing about this film that isn’t wholly entertaining. Amidst a sea of paint-by-numbers, run of the mill action flicks that come and go as if they never existed, Mission: Impossible continues to be the standard in how to do it the proper way.